Welcome to Just Bagels – Bagels Ain’t Bagels, Unless They’re Just Bagels! Have your food & beverage buyer contact us today! Bagels have been around for centuries. Over time it has been enhanced with flavors and toppings to satisfy the changing tastes of consumers. Today, the traditional bagel has taken a diverse line of delectable products that offers a multitude of flavor options to consumers everywhere. Here at Just Bagels, we pride ourselves on preserving the rich history of the classic bagel. Our plain bagel is a favorite to many customers and it continues to melt the hearts of everyone. While preserving the classic taste of the traditional bagel, we innovate our products to offer you a diverse product line to offer many flavors and toppings. We at Just Bagels are committed to serving you products that are made in factory using a state-of-the-art manufacturing process that adheres to the strict OU Kosher supervision. It is our aim to make every bagel the best for our customers. We want your restaurant, market, airline, hotel, college cafeteria or coffee shop to have the happiest customers every time they sink their teeth into the best tasting bagels available. 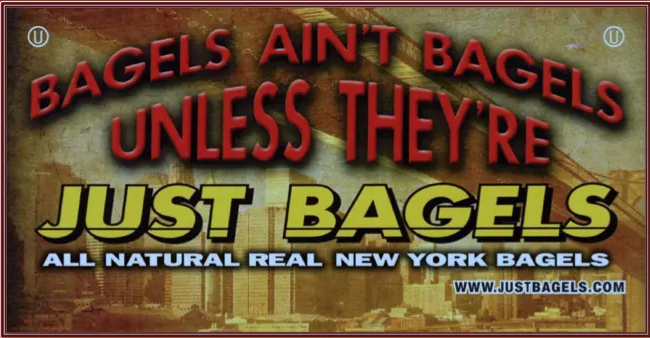 Because they ain’t bagels, unless they’re Just Bagels! Bagels Ain't Bagels Unless They're JUST BAGELS! The ultimate bagels for restaurants, hotels, coffee shops, specialty grocery stores and airlines. Wake up to a beautiful day with the aroma of freshly baked bagels waiting for you. Let us put a smile on your customer’s faces every time you serve them a bagel! Welcome to Just Bagels. Since we started in 1992, Just Bagels has captured the hearts of many bagel lovers across the world. We are present in all 50 states, 40 countries across Europe, the Middle East, Asia and more. © 2017· Just Bagels Theme by HB-Themes.